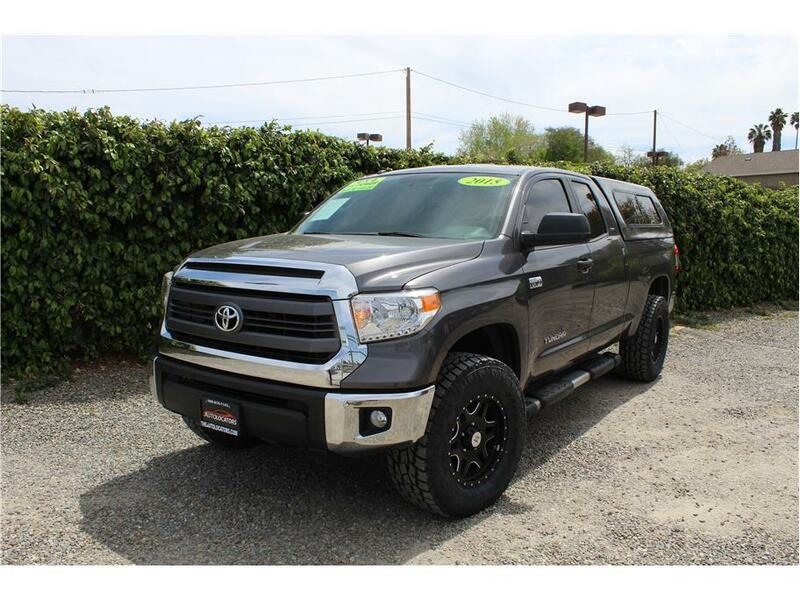 This 2015 Toyota Tundra SR5 Double Cab 4×4 truck has a 5.7L V8 engine with an automatic transmission and 71k miles. Our Tundra comes nicely done up with after market modifications like a leveling kit, brand new 35×12.5×18 Toyo A/T tires wrapped over American Outlaw wheels, a color matched lockable Snugtop camper shell and a K&N drop in filter. Factory features don’t fall short like Bluetooth connectivity, Aux, touch screen multi media panel, bed extender, running boards, power group, tow package, XM radio subscription capability, 4×4, digital compass on the rear view mirror, center console shifter and ice cold air conditioning! This Toyota was just put through a complete 151 point inspection by a licensed repair shop and received a fresh front and rear brake service, air and cabin filter, oil change service and four brand new Toyo Open Country All Terrain tires. This truck is ready to go, come test drive it today! Here at Auto Locators we take trade-ins, and have great financing options for all types of credit, including first time buyers. We can help arrange shipping of our vehicles anywhere on the planet. Auto Locators is a family owned dealership that was established in Southern California for over 16 years. We are also a California Licensed repair shop and all of our vehicles receive a 151 point complete and comprehensive inspection by our licensed mechanics. When you buy a vehicle from us we welcome you to our family. Call 909-810-1143 or Text 909-939-9434 or come by today, you can also view our entire inventory on our website at www.theautolocators.com. you can also fill out an application for financing to expedite your dealership visit. We aim to make your buying experience as quick and painless as possible, and get you on the road in your new vehicle! Copyright © 2017 TheAutoLocators: Redlands & Yucaipa’s Custom Truck, Jeep, Car & 4×4 Dealer.